1. How did you get interested in macrame? When we moved into our current house about a year ago, it was pretty much a total disaster. Leaky roof, broken windows, uneven foundation, plumbing issues....you name it, we had it. We slowly started turning our fixer-upper into our home and it gave me the room that I needed to explore my style. I really wanted to fill our house with plants so I started making macrame plant hangers. I quickly moved on to larger scale wall hangings and I haven't stopped since. 2. How long have you been an artist? Not very long at all. 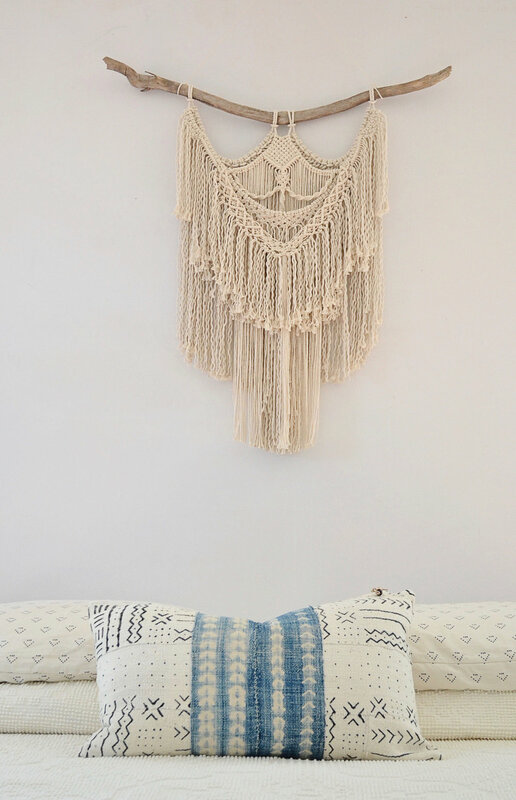 I only started to create macrame hangings about 9 months ago. Before that I was a stay-at-home mom to my two young children. I've always loved creating things and home improvement and design has been a passion of mine for a long time. I still feel a bit giddy that I get to spend my days making beautiful things. 3. Tell us a little bit about you that others might not know. Before I had my first child in 2012, I worked for almost 10 years at a creative ad agency as a project manager. I really loved watching people create amazing things day in and day out and I always regretted being on the business side of things. I would never have guessed that my decision to leave advertising and be a stay-at-home mom would eventually lead me to this life as a Maker. I feel really blessed and very lucky to be surrounded by a supportive group of family and friends who encouraged me to take that leap into starting my own business and sharing my passion. 4. How many pieces do you make each month and how long does each piece take? This really varies from month to month. Right now I'm very fortunate to be in a position where I can book myself out a few months in advance. The really amazing thing about running a business from a digital platform like I do is that I can work as much or as little as I want to. I try to leave time in my schedule to grow as an artist (I recently learned to weave on a loom and I love it!) and to enjoy my family. Sometimes I can work on a single piece for a few weeks and other times (if my husband is around to keep the kids occupied!) I can finish something in a day or two. My mixed textile pieces take a very long time to complete because they are so layered and intricate, but I really love making them! 5. 3 words to describe you! Isn't Sara wonderful? 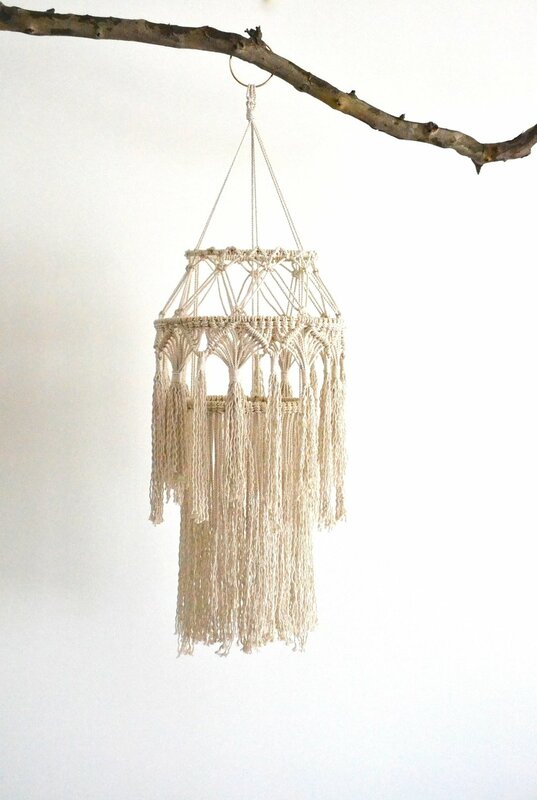 I can't believe she has only been making these beautiful modern macrame's for 9 months! If you are interested in her work you can find her on her website and on instagram. I hope you have been inspired today darlings! Have a wonderful one. A photo. A memory. A time when everything stands still. A moment that is captured and taken with you the rest of your life. Pictures really do speak a thousand words. When I look at a photo I can remember that time in my life, in our families life. The good, the bad, the blessings and the difficulties. I started having my daughter's photo taken when she was a baby and then our family photos were taken around the same time. I remember thinking, oh this is expensive and over our budget at the time. I tell you what! The best over spending I have ever done! There are so many great photographers out there and a lot will do mini sessions for a discounted price. I love some of my local peeps Janine Wagner, Amber Noelle and Else Kerkmann. It has been fun using different photographers as they give you a different look for your photos. Displaying your photos in your home can be overwhelming. I did one gallery wall of my kiddos as our space is small. However, I like the more artsy look with art and findings and photos mixed in. One of my favorite photos is one we had printed out on wood from Wood Snap. I love this company and they do such a great job. Sign up for the emails and get ready to get a discount! It isn't too late to start your photo gallery. If you are a darling single, a couple, family, an extended family, a pet owner, young, old....go for it! It all can be done and memories can be made. I adore art, especially when it comes to a good gallery wall. A darling wall can demonstrate character, texture and an overwhelming sense of prettiness. I recently gave a Love it styling gallery wall consult away on instagram. It has been fun finding the perfect images for this lovely new client and you can follow along the gallery board here on Pinterest. Here are some of my favorite gallery walls thus far. Look at how they are styled, grouped and have an overall sense of meaning. I have two gallery walls in my little bungalow and the one in our bedroom is my favorite. It has touches of stages of our life together, travel and meaning. When doing a gallery wall it is up to you how you go about putting up your items. You can choose to display all your items on the floor ahead of time if there is space and then transfer the look up to your wall. You can measure or not, which I do the latter and it actually gives me more of the eclectic look I like. However, you might want a more precise look and cutting out paper of your images and putting it directly to your wall first to get the vision might be more your taste. 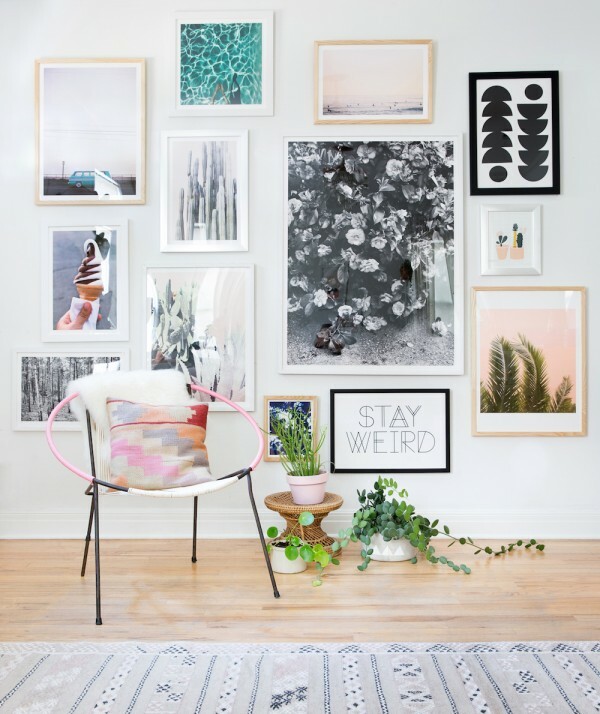 A gallery wall should be a fun experience, and a place that you will enjoy for years to come. If you have any questions are need help starting one, visit my Love it Styling section and shoot me an email. Have a beautiful day darlings!